The Saturn Junkyard: Elend's Most Fabulous Segata Creations! 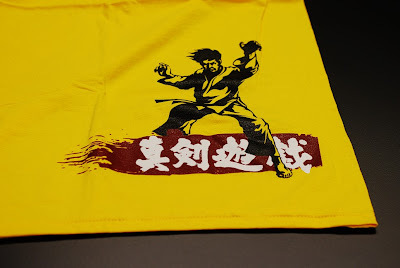 For HE in his infinite wisdom, has produced a most excellent piece of 'haute couture', the Segata Sanshiro t-shirt! Bask in it's glory! Offer prayers to it's magnificence! For it is the 'body draping' tribute to our esteemed leader! Give thanks to Segata and pray this comes our way! The overall design, the attention to detail...it's just awesome. I specially like the banner on the front with Segata Sanshiro written in katakana. We are thinking about a re-print. Unfortunately they were quite expensive because of the 3 colors print, which also exceeds the maximum size, which can be printed in one go. One Shirt was approx. 30 USD. XXL is no problem, tho. A must have for each cult member methinks. Could the reprint include robes (with hoods obviously) too? So is the link the actual files for the shirt? 'Cause it's a .rar file. In the .rar archive there are some more pictures of it. Like the 2 shown above. I can also provide you the original vektor files of Segata Sanshiro for further usage, if you want. They are .ai (Adobe Illustrator). If you do actually do a reprint where can I find out when you're doing them? I'd love one!